Valery Gergiev (*1953) will be the next Chief Conductor of the Munich Philharmonic, starting 2015 through 2020. 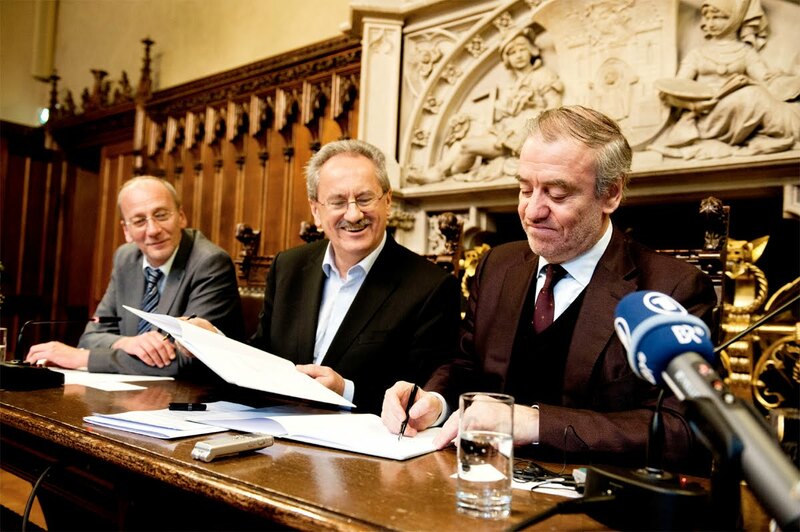 Earlier this Friday he signed the contract that will have him succeed Lorin Maazel1. For those who wonder why the world famous2 wunder-maestro Gergiev signs on with the widely considered provincial, second-tier3 Munich Philharmonic, the answer will depend on their level of cynicism. In his defense, what else is he supposed to say? ‘I was bored just with the Châteauville Foundation, I can really use the cash, my wife loves Munich, it’s just a few weeks a year, and it can’t hurt my reputation, because no one will be looking.’? The answers for Gergiev are just a little different. To figure it out, look at a map: Munich is nice and central and has a great airport with excellent connections: It's a perfect base for international operations. Gergiev has been wanting a position with a central European orchestra; it’s where most of the classical music action is. His center of gravity will always remain St.Petersburg (where he has “too much power”, he disingenuously complains), which includes all the several residencies of the Mariinsky orchestra abroad. But Munich is very convenient in every way, the Philharmonic a better-than-its-reputation orchestra he already knows reasonably well, and the job pays very handsomely. That certainly helped in tipping the scale, although I doubt that Gergiev is in as dire a need for money as Maazel or that he couldn’t make as much or more with enough guest-conductor-tingling. But the part he repeated about focusing more and more on fewer and fewer orchestras rings true enough. And Gergiev did confirm, however ambiguously, that he will step down from his post at the London Symphony Orchestra in 2015 after ten years as principal conductor. He will surely retain some role with that orchestra in England and abroad, and he won’t neglect the United States either (either directly or via the Mariinsky), but Munich will at least be his proud Musical Wife No.2, ahead of whatever orchestral lovers and affairs he will maintain on the side. Ultimately the question of whether Munich is the right orchestra for him is his to answer, which he did by signing up. But is he the right man for the orchestra? He is certainly the man the orchestra wants. During the press conference, the culturally hemi-demi-semi-interested major Christian Ude spoke with involuntary candor when he introduced the maestro with the following words: “When Sergiu Celibidache died, I promised the orchestra that I would do anything to get successors with an international reputation to defend the name of the Munich Philharmonic in the world… The status of the orchestra has been secured with this personnel decision.” He cited James Levine (utter failure), Christian Thielemann4 (unfulfilled potential), and Lorin Maazel (transition appointment) in support of this noble, totally misguided aim. It was refreshing, though, to hear it pronounced officially at last: Name-recognition trumps everything. Not the orchestra is to make conductors famous, the conductors fame is to lift the orchestra into the spotlight and to international recognition. The head of Munich’s Department of Culture, Hans-Georg Küppers, didn’t seem to like what he heard, seeing how that was exactly not the impression—however much truth there is to it—the orchestra and Department of Culture want to give. So he insisted a little extra strongly, when it was his turn to speak a few self-congratulatory words, that it was decidedly not the ‘big name’ that guided this appointment. Instead, principal importance was placed on what happens, or will happen, between orchestra, conductor, and audience. A very generous interpretation would be that Küppers is fibbing only on the former, and that it is genuinely both aspects that were of concern for those involved in the appointment. The greatest plus to Gergiev at the helm of the Munich Philharmonic might be that his reputation and stature—generally and with the orchestra specifically—is such that he can afford to take the reins harder than many other conductors would get away with. That is something the orchestra needs as least as much as diligent rehearsal work (which the Russian jet-setting maestro is, alas, not known for). Gergiev is also not known for an expertise in German repertoire. That’s the music the Munich Philharmonic prides itself in, though—even as it does nothing5 about its musical heritage, unless conveniently. A problem on the surface, but not an inherent one that dooms the relationship: Judging by the improvement of his Wagner over the last years (from a dismal, uncomprehending effort at Parsifal with the confounded Mariinsky Orchestra in 2006 to his very promising current Ring Cycle on LSO Live), judging by his best (though not his average) among the Mahler recordings and performances, or judging by a lovely Strauss Duett-Concertino for Clarinet & Bassoon I heard with him at the Barbican, he’ll come around quickly enough. And whatever else doesn’t jazz his bell (™ Thomas Hampson), there are always guest conductors to unload that (Pfitzner) off on. Gergiev himself looked a little under the weather during the presentation, but to mark the occasion, he appeared in a state roughly akin to shaven. He started out saying that he wouldn’t talk much about himself… then managed to squeeze the litany of his achievements into asides, correcting, where necessary, the translator to make sure that no one accidentally misunderstood just how many times he conducted at the MET, or how many orchestras in just one season in the US alone. He also managed to respond to questions in detailed and excruciating manner while answering elaborate circles around the actual point the given question. On the issue of the modest acoustic of the Philharmonic Hall, he managed this diplomatic litote: “It’s absolutely not impossible to achieve good results in the Gasteig.” The—arguably banal—question6 as to why he had conducted with a toothpick the night before7 was avoided by throwing this catchy phrase to the journalists instead: “Small, big—size doesn’t matter… If you went out to a Chinese Restaurant and got me chopsticks, I could conduct with one of those just as well.” Now there’s a juicy quote, better than an actual answer. 1 Lorin Maazel self-described his three-year tenure as an “artistic bridge” as he sent word, congratulating Gergiev and the orchestra on the appointment. 2 “World famous” is certainly true for Gergiev, as far as classical music conductors go, but considerably less so in Germany than the Russian and English-speaking world. 3 “Widely considered” refers largely to outside of Munich... at home, they're (self-perceived) superstars. 4 CT was the last conductor to have been named General Music Director. Learning from the tensions that could (and did) come from the extra-musical competence this carries, place-holder Maazel and Gergiev are named Principal Conductors. The LSO seem to be smarting, judging by their terse press release (perhaps they hadn't had much warning...), but it'll probably turn out well for them. Gergiev was never a proper principal conductor, and the musical results were very mixed (not helped by Gergiev's reluctance to, shall we say, over rehearse). Meanwhile, the big young names (and some not so young) - your Petrenko, Jurowski, Nézet-Séguin, Salonen - have been at the other major UK orchestras, and the LSO is left looking a bit old and tired. Time to start afresh. Well, people will be watching Maazel and the orchestra next year at Carnegie Hall. Hopefully Gergiev will tour with them as well. The Rudolf Kempe recording of Korngold's symphony is still the best. Anonymous #2: Yep. That recording holds up very strongly, indeed, despite the cuts. Though FWM, in one of his best outings, is a very fine contender. I have to wait until season 2015/16 to put the LSO+chief conductor back on my go-to list? Bummer. I was hoping Mr Gergiev would get his marching orders before then. I've been to 16 concerts, and failed miserably to see what others see in him. His Tchaikowsky 5th Symphony last season was the straw that broke this camel's back, with its erratic but always far too slow tempi, as if the conductor had gone to sleep. The orchestra looked as though they were glad it was over as they fled the stage as fast as they decently could. Emperor Gergiev has no clothes. Dammit, I have to wait until season 2015/16 to put the LSO+principal conductor back on my go-to list? I've failed miserably to see what others see in Emperor Gergiev. After 16 concerts, last season's Tchaikowsky 5th Symphony was the straw that broke this camel's back, with eccentric tempi so variable and at times, so sluggish the orchestra seemed lost; the structure of the music certainly was. The emperor has no clothes. I'd like to see Yannick Nezet-Seguin succeed him, but his two major contracts both end in 2018 and there's a good job vacancy elsewhere then.